As we checked our gear, cleaned the base we called ours for four months, and packed all the equipment onto army trucks, we knew things were changing. Our Kav (tour of duty) with Shechem wasn’t finishing up, it was finished. I’d been on my last mission the night before. By 2pm, all our guard duties were over.We had a patrol out on its last run, when it would return, that would be the close on our operational activity in Shechem. 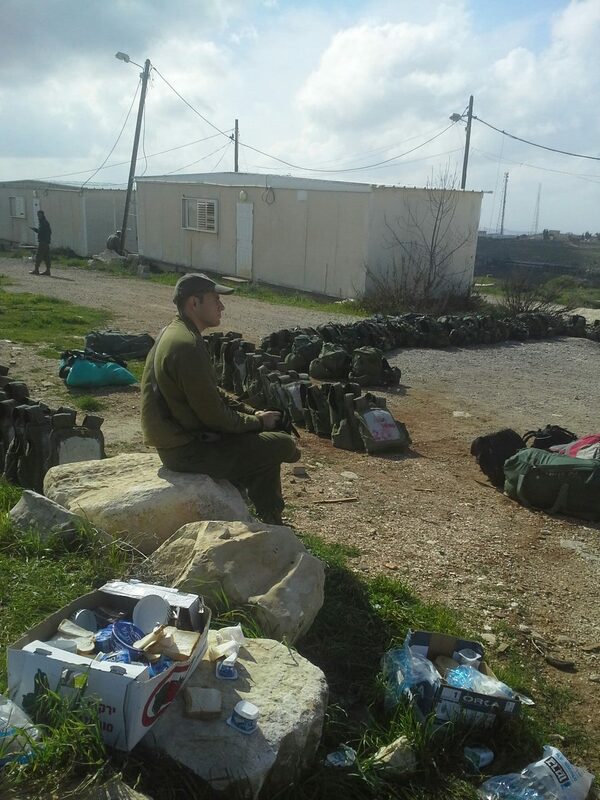 We placed our combat gear in the shape of a u (a HET in Hebrew) outside the gates of the base. Eventually the trucks were loaded, and then buses came to take us to our next base in the city of Kriyat Gat. A city in the south, not far from Ashdod. The battalion was changing. Two of our three platoon commanders went on to different battalions, our own battalion commander was on his last day of service before a long vacation and then civilian life. Soon after we arrived on our base, our battalion commander took us aside, and explained to us what would happen next. We would do some military exercise with the rest of Lavi for two weeks, then join a special force tank unit for a month. And that was it, he said goodbye and we knew despite all the crap we ate during our training days under him, we would miss his leadership. It was due to his leadership that our battalion was awarded the number one spot from all the other battalions. Since we were moving to a different unit, there was no new battalion commander to take over his job. His second in command was moving on to command a different battalion. Hence, all that was left for the position of command was our company commander. This task would be made easier by the fact that only my company was leaving for the special tank unit. The other companies would continue in the regular way, and thus found they had everything they needed when they joined the other battalions of my unit. Still, the fact that two of our three platoon commanders were also moving on to other battalions meant that this company commander turned defacto battalion commander with all the responsibilities that implies but none of the privileges like a second in command to handle the day to day, meant he would be overwhelmed and have just one platoon commander under him. For us soldiers in the company, we would be charting new territory with greater uncertainty than the norm in the army. Uncertain as to where we are going, what we’ll be doing, and who will handle our issues and how well? Uncertain as to who will we find where we arrive, when we arrive, at the next unit? We’ll be a group all our own, in a group all their own. What should we expect? All this, while our living conditions didn’t inspire confidence. Even in Shechem, we each had rooms with heaters for the cold winter nights on the hills of Judea/Samaria. Now, on this jobnik base of Kriyat Gat, we would stay in a section meant for combat soldiers. There, instead of rooms, there were large tents. It was here that I learned to sleep on a bed inside a sleeping bag instead of under blankets. As night fell, the cold of Kriyat Gat surprised me. I had to walk around in thermals and a coat at night. 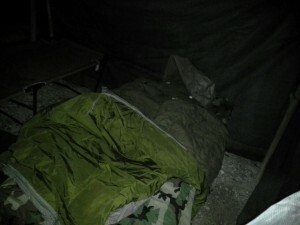 I slept that way as well, only removing my boots to be comfortable in my sleeping bag. Although the way I slept had changed, nothing was actually new. I’ve been cold in the army before, I’ve slept like a baby in far worse conditions. This was part of the atmosphere, but the feeling of uncertain transition gave it a unique feeling that no one spoke about but I’m certain everyone felt. That first night, after our equipment checks to be sure everything was brought and nothing was lost in transit, we gathered in my large tent. Our company commander wanted to speak with the company. 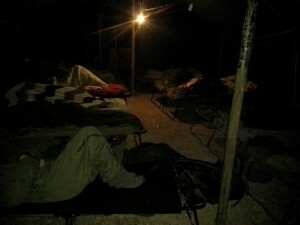 Each person sitting on a bed, most beds with two or more soldiers sitting, they seemed bored like me. 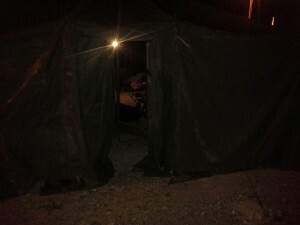 Though the night was cold, the mind was at ease and it was warm in the sleeping bag.